Twenty-eight AUSA chapter presidents, two chapter presidents-elect, two region presidents and one state president attended a two-and-a-half-day training program focusing on association membership and chapter operations. Attendees were welcomed to the national headquarters in Arlington, Va., by retired Gen. Carter F. Ham, AUSA president and CEO, and retired Lt. Gen. Pat McQuistion, vice president for membership and meetings. 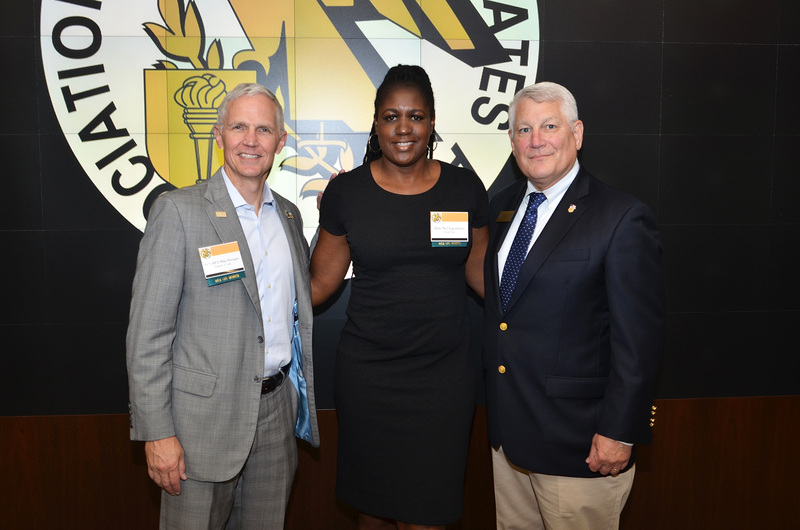 Retired Lt. Col. Mike Flanagan, Robert E. Lee Chapter president; Daila Espeut-Jones, Sunshine Chapter president; and Retired Gen. Carter F. Ham, AUSA president and CEO, meet during the New Chapter Presidents Training at AUSA headquarters. He added, “Some of the new chapter presidents are retired Army NCOs or officers representing the Regular Army, Army National Guard and Army Reserve, and some are still serving. “Others are Army civilians, or work in the industries that support the Army. Yet others haven’t served in the Army, but love soldiers and want to more actively support those who defend our nation. The program was hosted by the AUSA Membership Directorate, led by retired Col. John Davies, director of membership. Briefers included: retired Lt. Gen. Guy Swan, vice president, education; retired Sgt. Maj. of the Army Kenneth Preston; vice president of NCO and Soldier Programs; John Gifford, director, government affairs; Harry Rothmann, chief, technical officer; Patty Barron, director, family readiness; Christine Lathrop, deputy director and individual membership program manager; Megan Ryle, director, membership marketing; and Susan Rubel, director, affinity programs. Topics covered were: AUSA 101; individual and corporate membership; chapter communications; marketing; member benefits; chapter activity reports; Chapter Leader Portal; and retiree, reserve component and Army civilian membership; in addition to recruiting and retaining members. Congressional relations; the new AUSA website; family programs; young professionals; NCO and soldier programs; and an introduction to Magnet Mail were also on the agenda. At the conclusion, the attendees received certificates at a graduation ceremony.